For 12 years before he joined the Goom team, Anthony traveled the world extensively, manufacturing & exporting horticultural growing media. 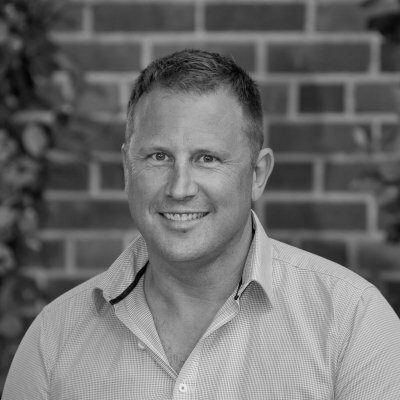 With his varied business life this brings a wealth of experience to the management, growth & strategic planning side of Goom Landscapes, and he looks forward to helping Tim grow this into a dynamic business. He initially got into landscaping after marrying Tim’s sister and deciding to buy into the family business. A few years down the track he can now proudly say that the things he enjoys most about our work is seeing the final results and a smiling team at the end of each job. You may not guess by looking at him, but he loves a good heavy metal concert! His first ever concert was when his Dad took him to see The Marmalade, Dave Dee Doxy Mick & Tich, & The Tremolos at the local town hall. Ever since then he has loved live music from Neil Diamond – Iron Maiden. Outside of business Anthony has been drawn into the Hunting and Fishing culture the Goom men are well known for, along with his two teenage sons, Caleb and Ethan. As a self-confessed foodie Anthony enjoys cooking which generally puts him in charge of the camp kitchen and ensuring the bar is well stocked for the tall stories. On the sporting side of things, Rugby engulfs a large amount of time in the Washington household. After many years of playing and coaching rugby, winter months are now kept busy with coaching teenage Rugby. When not being dragged off on a Goom outdoor adventure Anthony’s favourite holiday is lying on a Rarotongan beach with his wife Sarah enjoying a good read with a few cold drinks.